Slack is finally catching up to rival collaboration apps with the introduction of its screen sharing feature. To make up for its tardiness, the company has baked in a few additional useful features that put it head and shoulders above the competition. Fire it up by clicking the display icon while on a video or voice call with a contact, and they’ll be able to see your entire screen. You can also allow others to doodle on the contents of your screen so as to highlight or draw attention to things like points on a chart. The doodles automatically fade away after a few seconds. What’s especially neat is that you can also let others take over your desktop, just like a remote control app. They can click around, scroll through windows, and type when you grant access. That’s infinitely useful for when you’re poring over lengthy documents or complex design projects with a group. In my brief test, I found Slack’s screen sharing tools to work flawlessly, with just a bit of lag between your actions and what happens on your caller’s screen. Other than that, the screen sharing doesn’t affect call quality, and doodling works smoothly. With all that, Slack offers a step up from the traditional screen sharing features available in rival collaboration and group chat apps. 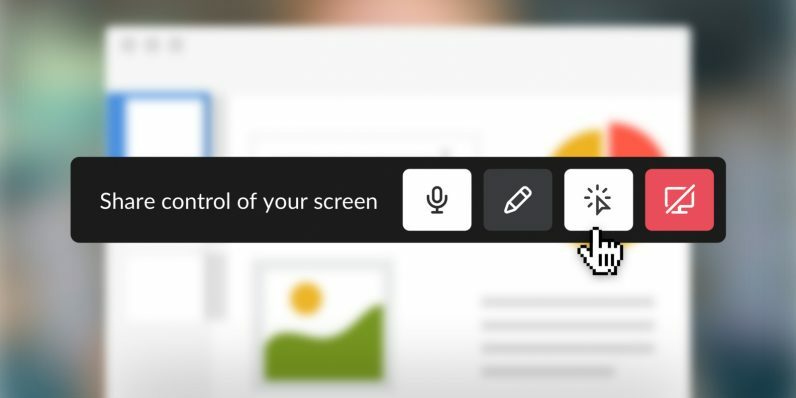 The new features come from the folks behind Screenhero; Slack acquired the six-man team back in 2015 to enhance its screen sharing functionality. They only work on Slack’s Windows and Mac desktop apps for now – but hopefully, screen sharing will eventually arrive on mobile (at least for spectators). You’ll need to be on Slack’s paid plan for this to work though. Hopefully, it’ll negate the need for groups of Slack users to resort to trying other apps for the same tasks during remote meetings, and keep Slack’s growing competition – from Microsoft Teams, Facebook’s Workplace, Atlassian’s Stride, Zoho Cliq, Flock, and Keybase’s Teams – at bay. Update 10/26: A perceptive reader pointed out the fact that this only works for people on Slack’s paid plan. We updated the post to reflect that. Thanks, perceptive reader!